Known to be an innovating force in the fashion industry, Dutch designer Iris van Herpen has expanded her boundary pushing design into a new frontier with her recent Shift Souls collection. The series, which was unveiled on the runway in Paris last week, consists of a number of billowy, celestial garments as well as head-turning 3D printed face jewelry. Not one for sticking to conventions, van Herpen has gone beyond traditional face jewelry—such as earrings, necklaces and even piercings—to introduce one-off, 3D printed face adornments. The pieces, called Cellchemy, are almost cage-like in how they sit on the wearer’s face but are evocative of something more auspicious and otherworldly. Van Herpen utilizes one of her favourite technologies, 3D printing, to produce the unique Cellchemy facial ornamentations. As the designer explains on her website, the wire-like masks were printed using a high-resolution multi-material 3D printer and were realized through a collaboration with the Delft University of Technology in the Netherlands. Each piece, custom designed for the model wearing it, was created using a generative design process. More specifically, a 3D scan of the wearer’s face was input into a design program running the Grasshopper algorithm, which combined colour information with the 3D model to generate a “semi-arbitrary density structure” that was mapped to the face. The 3D printed face jewelry complements the rest of van Herpen’s Shift Souls collection, which features a series of 18 of captivating garments. For this particular collection, the designer was inspired by early celestial cartography, such as Harmonia Macrocosmica, a 17th century star atlas by the German-Dutch cartographer Andreas Cellarius. She also drew design inspiration from “Cybrids,” human/animal hybrids which are now becoming a reality thanks to advances in DNA engineering. Notably, van Herpen also worked in collaboration with artist and former NASA engineer Kim Keever, whose work combines painting and photography resulting in an “aquatic expressionist” effect. 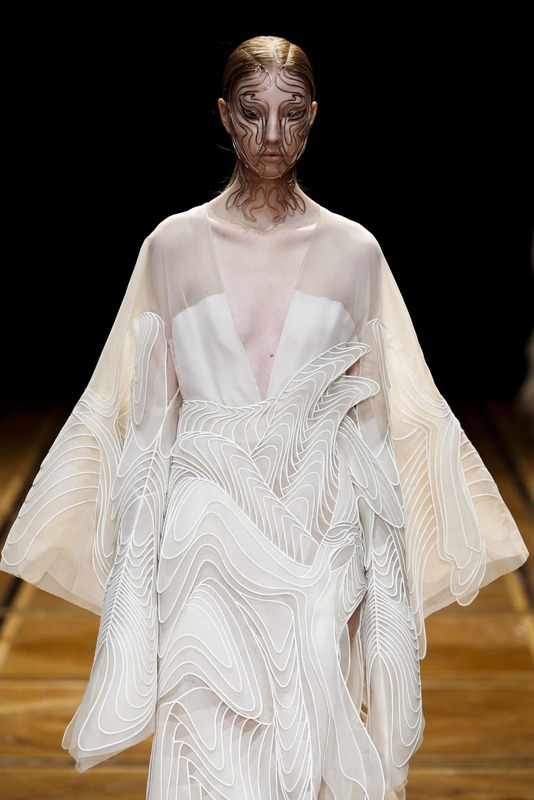 Keever helped van Herpen realize the transluscent layered cloud dresses, which are reminiscent of his work. The dresses in the collection abstract the human female shape, creating new silhouettes and exploring a variety of textures—from layering, to pleating, to folding, to undulating waves. These textures and textiles heighten traditional garment-making techniques using a range of modern technologies—van Herpen’s signature. For instance, the Dutch designer utilized 3D lasercut PETG and mylar frames to create new, avant-garde shapes using traditional fabric.